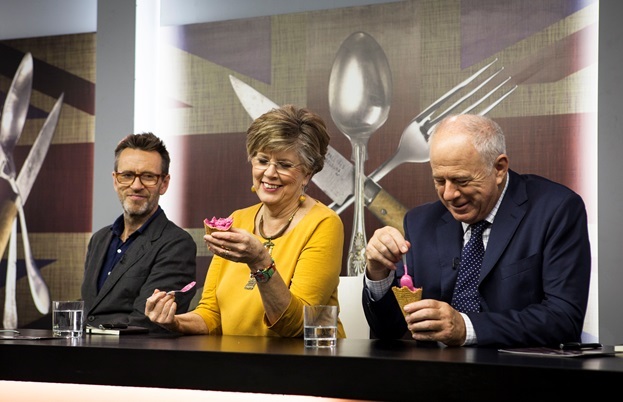 Danny Kingston takes us through the past five days of the cooking competition, which saw edible cricket pitches and sardine bologneses try and impress mentor Lisa Allen. 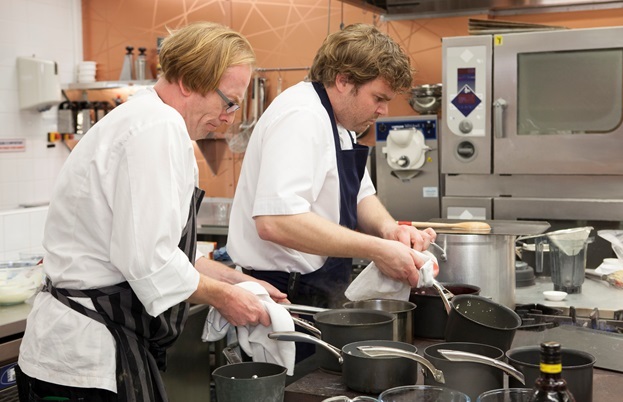 On the Great British Menu this week, it was time for three esteemed chefs from the South West to do battle. I don’t know what they are putting in the water down there but this has to be the chummiest round I have ever seen. Third time lucky Josh Eggleton, second time round Jude Kereama and newcomer Chris Wheeler were practically falling over each other to help whenever they could. 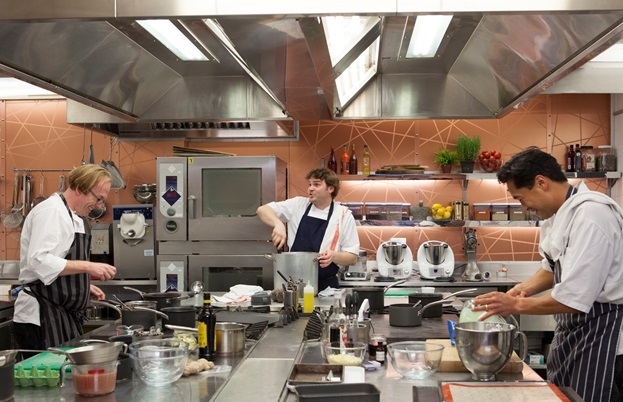 Which is not the done thing in cookery competitions. We want backstabbing, snidey comments and all out war on our telly box, thank you very much. Not this sort of bromance fest. Bloody hippies, I don’t know. And if that wasn’t bad enough, judge and mentor for this week Lisa Allen brought her mate Simon Rogan to the party for a double whammy. 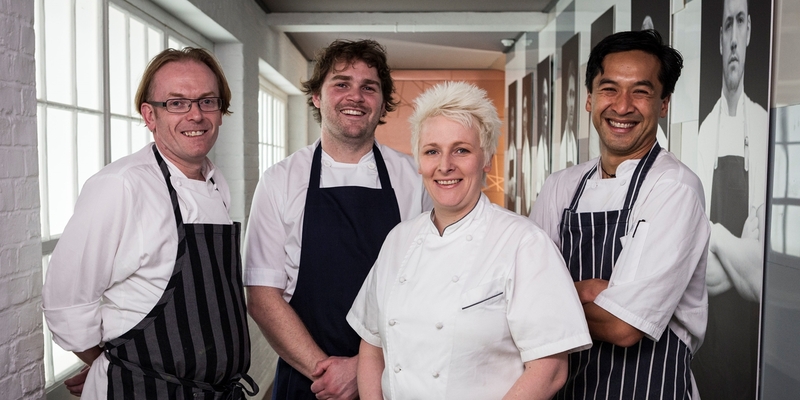 What do they say about too many chefs? But Lisa can be forgiven for sneaking Simon in after closing time. She has a shellfish allergy, a tough draw for a Michelin-starred chef, so Mr Rogan was really just there in a capacity as a taster. Although he did also have plenty to say. Especially whenever Lisa piped up, in a haughty voice: ‘This Simon. Eat this for me.’ Which she didn’t but it would have been fun if she had ordered him about like that. Starting with the starters (which is a good place to start) Josh kicked things off with his twist on Coronation chicken, a dish originally created for Queen Elizabeth’s coronation way back in 1953. His version was in the guise of a terrine, layered with lobster, as well as the ubiquitous chicken, along with a plethora of side components. This was accompanied by lobster oil, curried mayonnaise, poached apricots and membrillo (a type of thick jelly, as clumsily described by narrator Wendy). We also met some of his farmer mates, which was nice, but alas for the judges, his curry flavour was not quite coming through. Jude was up next and he wanted to blast the judges away with his ‘Crank Up The Radio’, a dish made from radishes, alliums, Dexter beef, ice cream (made from Parmesan) and oysters, all to honour the inventor of the wind-up radio, whose name escapes me. Quite clever really because if you take the first letter of each ingredient, that spells R-A-D-I-O. Aha! Yes! Brilliant! However, despite the all technique, cute assembly and nifty use of props, Jude forgot to plate up his lotus crisps. And that really disappointed Simon. Because he loves lotus crisps. (I, on the other hand, am a prawn cocktail man). Flamboyant Chris wanted to focus on the Queen’s dressing table for his starter, a theme that sort of came from nowhere and had nothing to do with the brief of honouring Great Britons. But he ploughed on nevertheless, creating an assembly of duck rillettes, venison carpaccio, his own brioche and a Parmesan tuille crown. Oh and he also served up a glass of gin and Dubonnet. According to the judges, it didn’t quite work and you could see why. But Chris was having fun, so he was happy enough. For the fish round, Lisa was expecting a lot more from our chefs and wanted to see plates of food where all the ingredients worked in perfect harmony with each other. And Chris, who was up first, certainly delivered a more coherent plate called ‘Swimming Through The Paths Of Time’. Using mackerel four ways, i.e. pan-fried, pickled as an escabeche, battered with chips and then delicately poached for soup or ‘nage,’ he made a big improvement, but his feel for the theatrical meant that it all simply looked too much like the seaside. With very little relevance to the brief. Jude similarly came a cropper with his ‘Britannia Rules The Waves,’ a fish course that would have looked more at home in Brazil and themed on the Olympics. Based again on coronation chickens but with lobster taking the central role, his added plenty of signature Asian flavours. Textures of mango, yuzu with ginger, purple butterfly sorrel and coriander cress all made things look very pretty. However, the judges weren’t really convinced. Worse still, Lisa wasn’t happy that his curry mayonnaise had split. Oh my. In terms of hitting the brief, it was Josh who came up trumps with his homage to the RNLI and the volunteers who selflessly go to sea to save lives. Called ‘For Services to Maritime Safety’ he brought together the best of the ocean, in the shape of scallops dusted with dehydrated roe, a potato-less hake fish cake, pickled cockles, pan-fried mackerel and a very curious sounding sardine bolognese. He also gave his blacksmith a headache in the process, to provide elaborate anchor-themed forks for his decorative plate. It was bang on, according to Lisa and she awarded him a 9. With a few tweaks, it could be a 10. 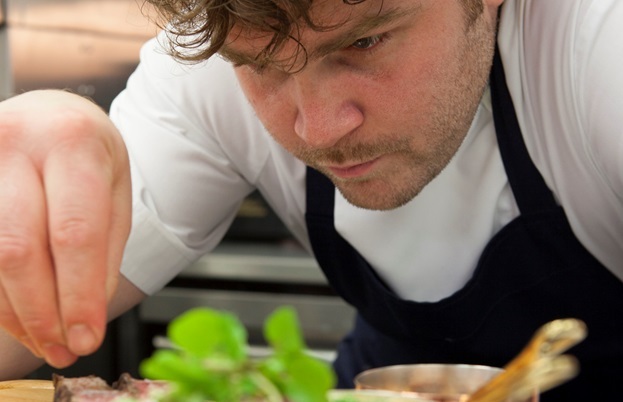 Despite surging ahead, for the mains course Josh was adamant that he couldn’t rest on his laurels and to ensure that he maintained a lead, he decided that a celebration of British beef was the order of the day. Nodding to our Gallic cousins, who like to call us ‘Les Rosbifs’, on account of apparently not being able to cook beef properly, I did wonder if Josh’s two fingers up was in keeping with the theme. But he equipped himself well and delivered a gorgeous looking board of yielding oxtail ragu, ox heart salad, bone marrow on toast and rare Dexter ribeye. Jude also decided that he was going to pull out all the stops by rustling up not one, but two twists on two classics. Namely cottage pie and beef wellington, but with venison instead of beef. It was at this stage of proceedings that we finally had drama, as his ‘V for Valour’ was very nearly overdone by some suspicious knob twiddling on the oven. To get his wellington to cook to perfection, he needed a constant 200°C but someone, heavens to Betsy, turned it up to 220°C! Strewth! But it was OK. He saved it in the nick of time and didn’t feel the need for a steward’s inquiry. Whereas I would have been livid. 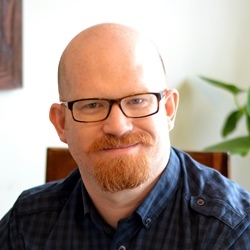 Perhaps it was an easy mistake to make though and I doubt very much that Chris had anything to do with it because he was up to his eyeballs in pea puree and poached salsify; trying to recreate a cricket pitch, with oxtail bats and bone marrow helmets. This was to be his most simple dish, by the way. Once again, Chris wavered too far for Lisa, who by this stage, began listening to his ideas with increasing bemusement and giggles. I think he was mistaking her nods as approval, but really, I think she was desperate to tell him to hold back and work on the cooking. Rather than his whacky presentation. In the desserts round then, I was gunning for Chris to just work on something that would not be style over substance. But once he announced that his pudding would be ‘Fun! Fun! Fun!’ I knew that trouble was ahead. A tribute to the wonderful music industry, with a tenuous link in visiting a performing arts school, totally muddied the waters for Chris. As he went on describing elements, using vinyl as a plate, ginger pannacotta to represent the Spice Girls and a coffee cheesecake in the shape of Elton John’s piano, I thought to myself, ‘This guy has lost it.’ And he did. Then again, if he’d been a bit more focused, he would have had to really pull something out amazing to beat Josh’s six point lead and legitimately entertaining ‘The Re-Emergence Of The High Street.’ Based on a high street, complete with market stalls, it was a huge, prop-led dessert most certainly and if it makes it to the banquet, people might have something to say about queuing. But this self-assembly scene stealer, where you have to line up for beetroot and white chocolate ice-cream and an array of clever, sweet vegetable toppings really was ‘fun, original and exciting’. By comparison, Jude’s dessert was a lot more refined and elegant. A play on an Eton Mess, with macarons, strawberries, chocolate mint and mint shards, he impressed Lisa with his efforts. Despite throwing in a little too much mint, Jude made it through to his first judging round. 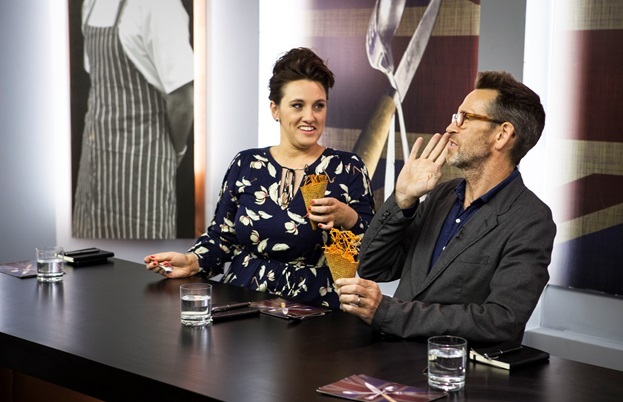 Helping our judges this week was food critic and author Grace Dent, who was over the moon to be on the panel and to finally become one of the family. But for all her joy, stating that ‘not many men had made her happy in the past’ suggested that the road ahead would be slippery and fraught for our chefs. And there certainly were highs and lows. Josh’s feted fish course did not give Prue much in the way of pleasure and to Grace, sardine bolognese sounded like something a student might rustle up. Likewise, Matt felt that Jude’s coronation lobster ‘struggled to emerge from the mire of mango’. As clinchers go though, I think it was Josh’s steadfast approach that saw him through. Everyone loved his mains and three of the judges awarded him 10s for his beef extravaganza. Grace was the odd one out; it didn’t make her heart leap. But the sight of an ice cream machine did and she jumped out of her seat to make her own vivid concoction. Like a giddy kid at Pizza Hut’s Ice Cream Factory, her grin went from ear to ear. And so Josh is now on his way to trying to get a dish at the GBM banquet for the third time. Let’s hope he does it. Next week, we head to the North West.